Branston Adams is proud to be a member of the exclusive Trafford Enterprises networking club. Networking is held at The Wheatsheaf Pub in partnership with Red Mist Leisure, supporting Phyllis Tuckwell Hospice Care. The Farnham networking events held at The Wheatsheaf have been key in introducing, and formulating great bonds between local businesses and suppliers. 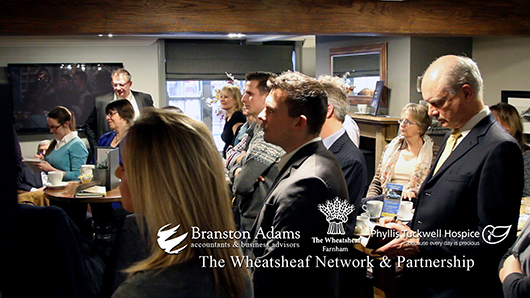 The partnership between Branston Adams Tax Accountants, The Wheatsheaf and Phyllis Tuckwell Hospice Care ensures a diverse (and busy) turn out each and every month, whilst the fascinating guest speakers range from gin makers and chocolatiers to inspirational business people, social media specialists and forward-thinking entrepreneurs. Held on the first Wednesday of every month, these local Farnham networking events are free to attend, with a suggested donation to Phyllis Tuckwell Hospice of £5 on your arrival. Email corporate@pth.org.uk to register for our next event. All of the team are prolific networkers and have experienced the benefits networking has brought to our own businesses. Always keen to do more we decided to launch our own independent networking group in Farnborough, or North Camp to be precise. You are guaranteed a warm welcome at our meetings as we love meeting new people but our events are very business focused too. So if you run a local business why not come along to our next meeting, say hello and tell us about your great local business. More information plus photos from our events can be found on our website: www.farnboroughnetworking.co.uk. We have round of one minute introductions at the beginning of the meeting where you get the chance to tell everyone in the room who you are and what you do, followed by open networking giving you the opportunity to have more in depth conversations over a cup of tea. There is plenty of street parking in the roads behind Wings Restaurant but please do not park in Alexandra Road itself as this is limited to an hour. There is also a pay and display car park nearby. See map on the contact page for details.